Matt, Is this your first negative image sketch? Very nice! Thanks! It’s a positive image sketch (black ink on white paper) that I scanned (ghetto scanned, that is, using a digital camera), inverted and cleaned up using GIMP. I think it is my first “serious” sketch. I have done little doodles of the planets to show the position of moons around the gas giants or the number of visible cloud bands on Jupiter, but only so I could look up the identity of the moons or cloud bands later. 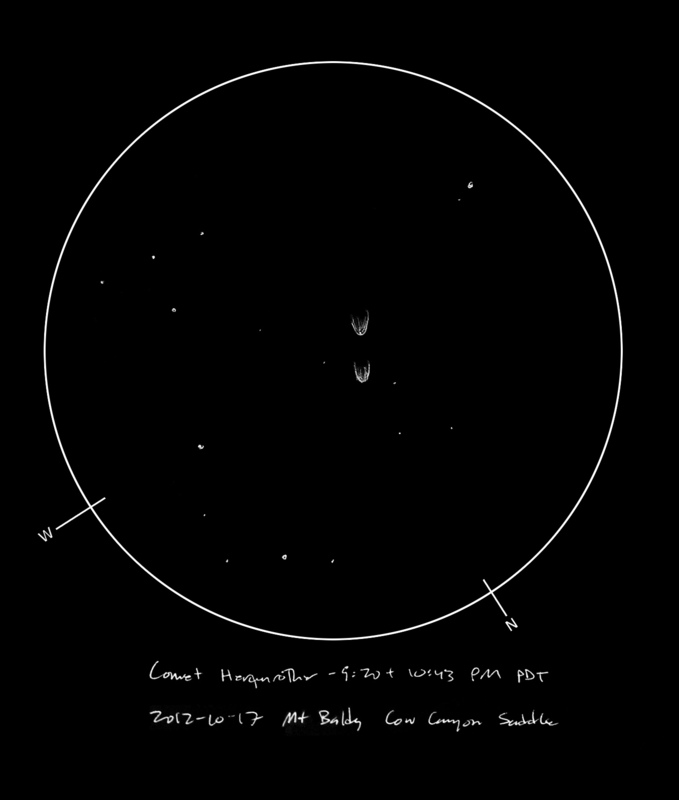 Even my comet Hergenrother sketch from last weekend was more informal. This is the first time I’ve really put a lot of effort into recording all the important stuff in one eyepiece field of view. It was fun to do, and I’m pretty happy with the result. Happy enough that I think I’ll start sketching more often. I gotta make good on the Suburban Messier Project soon.